However, a PRWeek poll found most respondents don't mind the cheeky campaign. 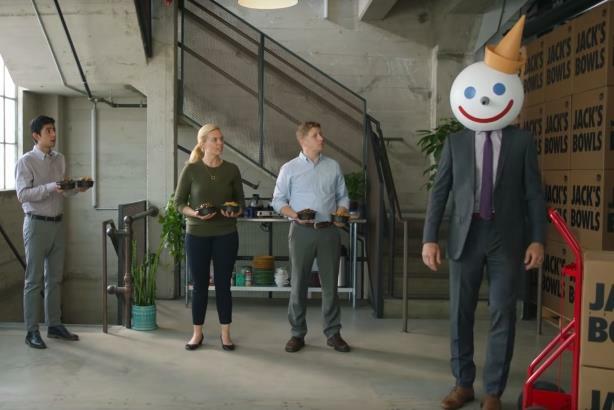 Most respondents to a PRWeek poll said they find Jack in the Box’s latest campaign promoting the chain’s teriyaki bowls funny, despite others’ views that it makes light of sexual harassment in the workplace. In the spot, Jack in the Box mascot and fictitious founder "Jack,", i.e. a guy in a suit with a fake, clown-like head, wanders through an office bragging about the chain’s teriyaki bowls -- but the way "bowls" is repeated brings to mind male genitalia. As of late Wednesday morning, nearly two-thirds of respondents to a PRWeek poll (64%) said the ad isn’t offensive, while 11% said it is. Nearly one-quarter (23%) said they’re indifferent. However, PR executives commenting on LinkedIn gave Jack in the Box’s latest creation mixed reviews. Here’s what five communications pros shared with PRWeek. It's cute! They even showed their self-awareness by having someone tell the innocent mascot he shouldn't be walking around talking about his bowls. Now, whether it's wise to associate Jack's "bowls" with a food product is another story. Similar to KFC live-streaming four hours of cats climbing on a movable Colonel Sanders last month. Some things you just don't want to associate with food. Is it the end of the world? Or even on par with Pizza Man? No, but you can’t ignore context either, particularly since JITB framed this campaign in the workplace. Will many think it’s funny? Sure. But many will feel guilty about it, and that’s as it should be. Don’t want to see humor normalize bad behavior, particularly in this area of life. #BustedBowls. One more point: if I were CEO of Jack in the Box, this campaign would have never seen the light of day because the marketing team would already know what’s expected of them in this area. So this is a leadership failure as well as bad judgement. I’m not sure the average person buying Jack in the Box’s product is concerned about social ethics as much as a good product and price. So long as the product marketing doesn’t commit a complete violation of social mores, then I think we’re being a bit sensitive. Also note that the comments made in the ad are directed at men, who aren’t immune to harassment but haven’t been the main targets of today’s Weinstein #MeToo offenders. I find it both offensive and ineffective. In the old days we would label it "gross."